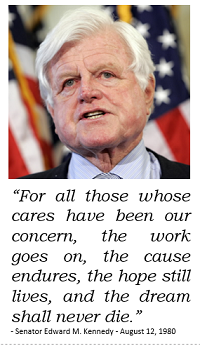 The anti-government Koch brothers are using their billion$ to wage war on Social Security. They want to destroy Social Security because it’s a huge Federal Government program that is successful. They want to privatize Social Security so they can cash in on it. It’s hard to understand the big picture on the many ways the Koch brothers are attacking Social Security. The following video by Robert Greenwald and Brave New Foundation exposes their coordinated efforts for attacking Social Security. The bad news is that Social Security is not their only target. They are anti-government and anti-regulations. All they want to do is make more money. More money so they can buy more politicians, at all levels of government. So Mitch McConnell, the most powerful man in the Republican party as the Senate Minority Leader and lead naysayer to all things Obama and middle class, heeds the call to come worship at the altar of the Koch brothers and their other billionaire friends. Kowtowing at their feet, McConnell and the other attending Republican cattle heap praise and thanks for all that the billionaires have done and promise to be true disciples of the Koch brothers agenda (translation: I have sold my soul to you, now please fund my campaign so I can keep my worthless job). This is going to help define the national narrative for the 2014 campaign: these tapes make 100% clear that the modern Republican party is controlled by the Kochs and their billionaire friends. The Kochs invite the most powerful party leaders, the most important candidates, to their “seminars,” and they all come running. These politicians thank the Kochs and their billionaire friends profusely, talk about how they wouldn’t be where they are today without them, and then tell them how they will battle on their behalf if they win. Last Friday Jane Mayer, a journalist at the New Yorker, dropped a bomb on the Koch machine by exposing the State Policy Network (SPN). 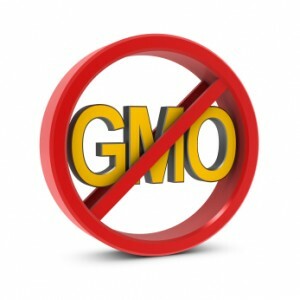 The SPN is a well oiled machine put together to ensure the Kochs’ – and other free market fundamentalists – political aspirations are achieved throughout the country at the state level. The original appeared online at the New Yorker Blog. But notes provided to The New Yorker on what was said during the S.P.N.’s recent twenty-first-annual meeting raise doubts about Sharp’s insistence that each of the think tanks is, as she told me, “fiercely independent.” The notes show that, behind closed doors, meeting with some eight hundred people from the affiliated state think tanks, Sharp compared the organization’s model to that of the giant global chain IKEA. During the meeting, Sharp also acknowledged privately to the members that the organization’s often anonymous donors frequently shape the agenda. “The grants are driven by donor intent,” she told the gathered think-tank heads. She added that, often, “the donors have a very specific idea of what they want to happen.” She said that the donors also sometimes determined in which states their money would be spent. Lisa Graves is the executive director of the Center for Media and Democracy (which discloses many of its own donors, including one grant from the Open Society Institute, funded by the liberal billionaire George Soros). 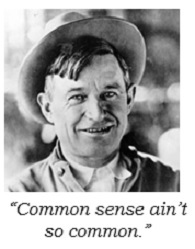 “Perhaps surprisingly, I would agree with Sharp’s analogy that S.P.N. is like an IKEA catalogue, where its state affiliates reproduce the same bad policies across the country,” Graves said, when I reached her in Madison, Wisconsin. Many of these legislative measures “divert Americans’ tax dollars away from our state public institutions and into the coffers of out-of-state, and even out-of-country, for-profit corporations, enriching C.E.O.s and Wall Street speculators at the expense of working families,” she said. 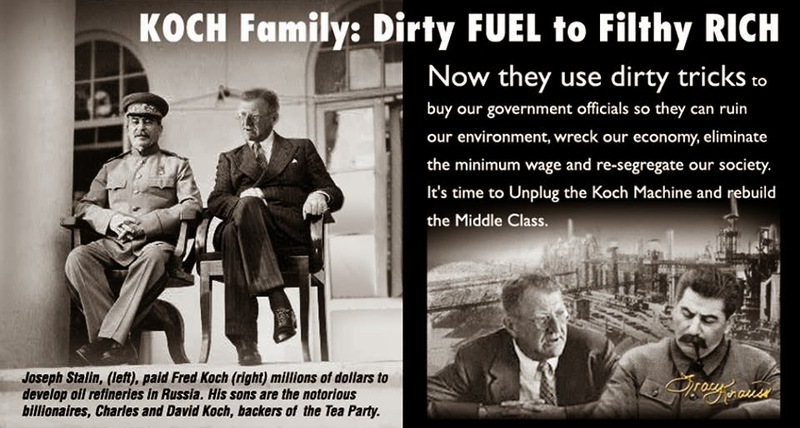 $100 Billion in Profits for the Koch Brothers. 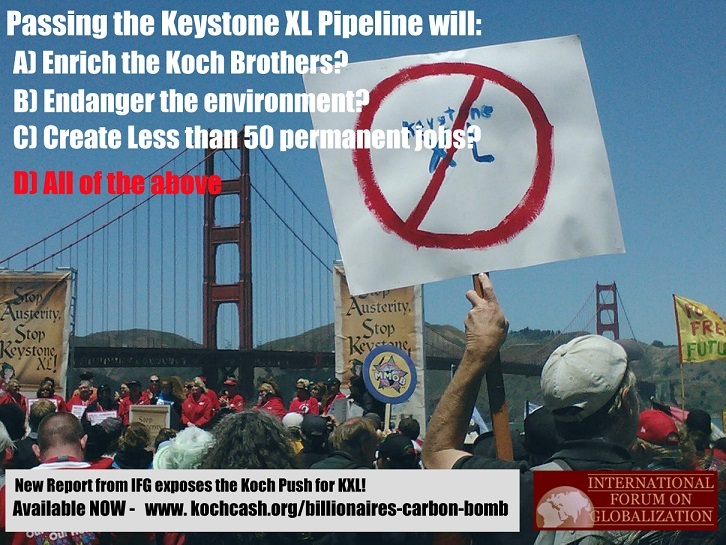 The owners of Koch Industries, Charles and David Koch, will benefit if President Obama allows the Keystone XL Pipeline to be built. 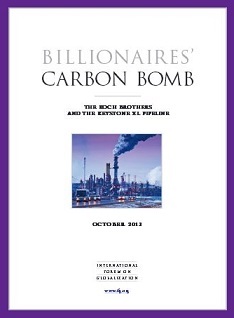 In recent years it has been reported that the Kochs hold up to 2 million acres in Alberta, could earn roughly $100 billion in profits from the project, and have spent more than $50 million on Congress and Think Tanks that heavily push for the pipeline. in the Keystone XL Pipeline. 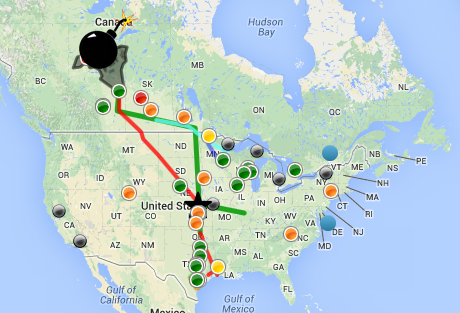 Below is a map showing all the Koch Assets in the tar sands as well as interests all along the proposed pipeline itself. The Koch Brothers are the single largest source of private money being used to push their personal, extreme ideology in American politics and policy. Their undeniable influence is paralyzing democratic decision-making in the US, and, in turn, around the world. 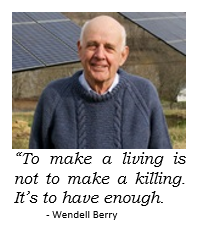 The problem is too much power in too few hands. The Koch’s combined net worth ($80.2 billion) now exceeds that of even the world’s wealthiest man, Carlos Slim ($71.8 billion). 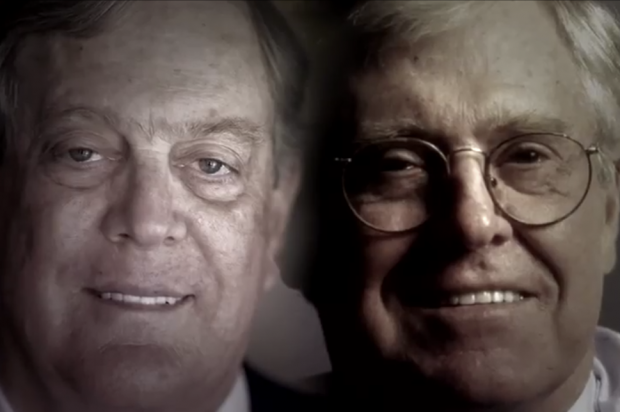 In less than three years after the controversial Supreme Court ruling that expanded the rights of private money in politics, known as Citizens United, the Kochs now exert their influence on a scale never before seen on the American political landscape, effectively buying blocking power in Congress through its radical faction of right wing ideologues. 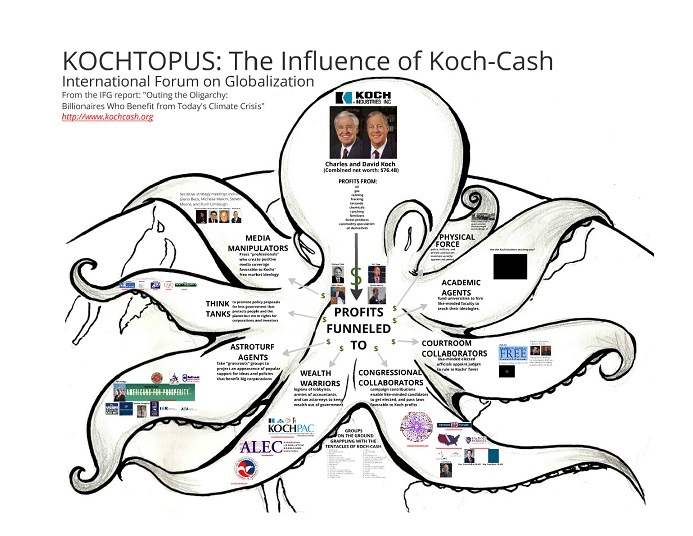 The Kochtopus is a map of the money, structure, and scale of the Koch’s influence network, and how Koch Cash is damaging democracy. 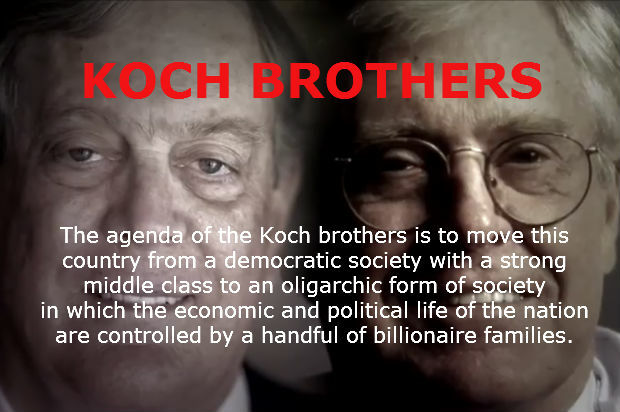 Watch the video below and follow the chains of influence to learn more on how the Koch Brothers have corrupted our democratic process.